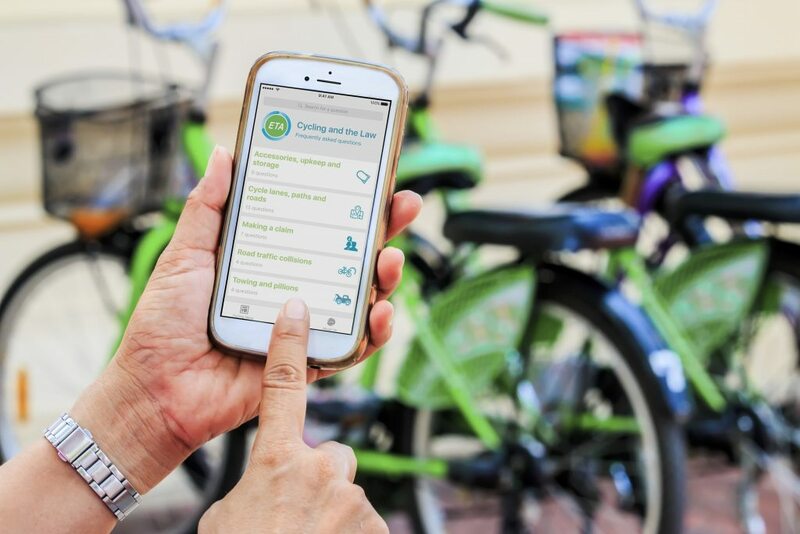 The Cycling and the Law app is a new tool designed to empower cyclists with instant access to free legal information and advice. The first release (iOS) app presents clear and concise answers to over 30 of the most common legal questions, with topics ranging from the legality of riding across a zebra crossing, to a cyclist’s rights in the event of a road traffic collision. Cyclists with a legal conundrum that is not already answered can use the app to contact a team of experienced solicitors and barristers. Other features of the app include an eclectic daily feed of bicycle-related news penned by a dedicated team of experienced cyclists. Cycling and the Law is available for free download via the button below. It is also available online as a full FAQ and as a free downloadable e-book. The ETA was established in 1990 as an ethical provider of green, reliable travel services. For every cycle insurance policy we sell, we make a donation to the ETA trust, our award-winning charity that campaigns for a more sustainable, safe, and healthy transport future. We were also named by The Good Shopping Guide as Britain’s most ethical insurance company in 2015 and 2016.